Dream Professional Blender from Rawmid online store embodies the qualities of a perfect machine: it is powerful, functional, convenient, and reliable. 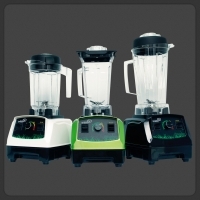 Here we present an exclusive blender family, specially adapted for Russian market. 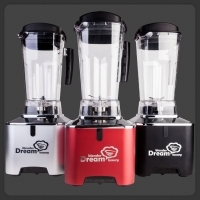 Dream Bar Blender suits for both commercial and home use. It provides fast and excellent blending, rich taste, new opportunities in food preparation, and the ultimate comfort when using the machine. Well designed – easy to use! 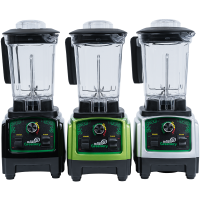 Blenders performance depends on three major factors – power, jug shape and knife quality. Advanced features and smart combination of these factors makes the Dream Blenders one of the most interesting on the market. Unique Japanese knife with six serrated blades rotates at high speed, reaching 38,000 RPM (blender Samurai Dream 4HP). Jug shape helps to create a result, that exceeds all expectations in speed and quality. Dream Blenders are great for green smoothies, ice, smoothies, frozen foods – they really can do it all. 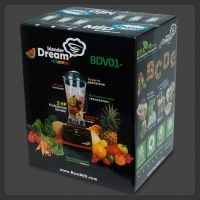 With Dream Blenders you can make: (1) fresh fruit juices and smoothies, (2) soy, nut and rice milk, (3) nut butter, (4) sauces and spreads, (5) hot soups, (6) salad dressings, (7) dough for baking, (8) flour, (9) purees, (10) chopped foods. The jug is made from Tritan in all the available models. This modern plastic is famous for been perfect for kitchen appliances. It has no BPA and other harmful chemicals, is highly durable and aesthetically pleasing, preserves the natural taste of foods with no nasty odors. Rawmid Blenders are ergonomically designed, some models (Modern Dream, Samurai Dream) include a handy pusher, useful for grinding dry foods (nuts, seeds, grains). Noise and vibration levels are reduced. This high-performance blender is highly reliable and will work for many years without any support. There is an overheat protection and an efficient cooling system on board. Searching for a professional blender? By choosing one of Dream models you will never have to buy another one. 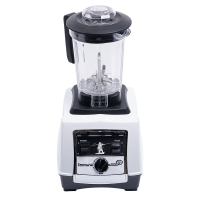 RawMID Blenders and other health products are available at a great price: you will find reviews and more information on our web site! Samurai Dream High-Performance Blender: 4HP For Your Kitchen Samurai Dream Professional Blender is a powerful kitchen appliance that is perfect for home use and restaurant business. 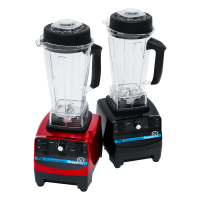 It combines the best features of commercial models, but at the same time offers a better price than the other p..
Every six months, in the range of RawMID blenders comes a new model. Engineers are constantly working to every device is the "bomb" on the market. So there were professional blender Modern Dream 2, which replaced the Dream Modern 4HP. The design of the model improved, the control panel is made co..
​Professional blender Dream luxury 2 bdl-09 - improved modification of the eponymous Luxury Dream blender. 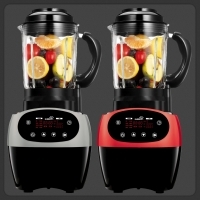 Professional blender Dream luxury 2 from RawMiD combines vibrant design, modern technology and high functionality. The speed and quality of work it is better than many industrial machine.. High-performance Blender Dream Classic TM-767: A new model for Russian market Professional blender Dream Classic TM-767 is an exclusive product that can be purchased only from the Rawmid.com online store and our dealers. Developed in the United States, high-power blender is extremely easy-to-..
Professional blender Dream Greenery 2 BDG-03 is a specially developed blender for smoothies and cocktails made from vegetables, fruits and greens. The device has enough power for quality grinding of any fruit and obtaining an ideally homogeneous consistency. At the same time, a special technology..
Professional blender Dream Vitamin – a unique offer from Rawmid: powerful, reliable and clever device at a price lower than analogues. It has all the advantages for a fan of healthy food – great potential in the preparation of healthy drinks and meals, simplicity, convenience and durability. 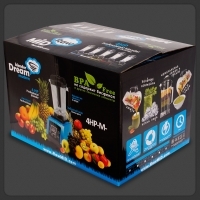 High..
Dream Greenery Professional Blender is a powerful model for green smoothies. Quick and thoroughly blends greens and vegetables, fruits, seeds and nuts, giving the drinks a perfect texture. Suitable for smoothies, purees, soups, dry milling of such products like seeds and nuts. Efficient and relia.. Powerful blender Dream Future 2 the 4 horsepower on Board grinds any products. But more amazing function of heating, which gives him the possibility of the multicooker. That's right: you can cook food and cook a variety of hot dishes, even without grinding. Smoothies with a soft texture, all kind..
Past Dream Professional Blender goes beyond competition because of its excellent features. It is a high-end vortex blender with outstanding performance and durability, modern design, perfect for personal and commercial use. 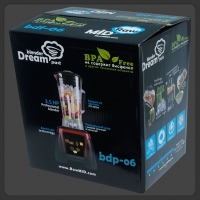 Past Dream Bar Blender draws attention of those, who aim to get the great..
Dream Modern 4HP discontinued. See new model Dream Modern 2. 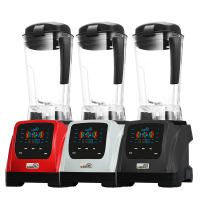 Modern Dream High-Performance Blender – A Perfect Kitchen Appliance Modern Dream professional blender is a heavy-duty model that will pleasingly surprise you with its extraordinary characteristics. It has a durable and mass..